needs more traditionally served by free-standing, separate buildings for churches, synagogues or mosques. Congregations representing the various religions would share a common facility — including sanctuaries – using it on different days of the week. The Meeting House at Oakland Mills is a fine example of the Interfaith concept in action. From its inception about mre than 30 years ago, the Meeting House has been home to Protestant, Jewish and Catholic congregations. Today, in additon to four Christian churches, it houses the Columbia Jewish Congregation – – an original “owner” from the day that James Rouse helped to cut the ribbon – – and Bet Aviv which has bought into an equity ownership position. Many Bet Aviv members feel an affinity for this special place where people of different faiths come to worship in their own way while sharing a common place. Since 2011, the Meeting House atrium has become the home of an art Gallery. 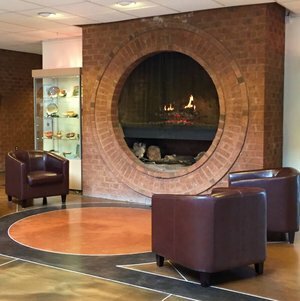 The Gallery’s mission is to provide a place for local artists and craftspeople to exhibit and sell their work and to beautify the public areas of The Meeting House. Representatives from the congregations of Oakland Mills Interfaith Center serve on the all-volunteer Art Committee, which selects the artists and exhibition themes. Bet Aviv has some talented artists and photographers among it members who regularly exhibit their work in The Gallery. Since becoming equity owners in Columbia’s Oakland Mills Interfaith Center, commonly known as the Meeting House, Bet Aviv has been an avid participant in Interfaith activities. As a gesture of friendship, we invited the spiritual leaders of our fellow Meeting House congregations to participate in a Shabbat worship service. During the aftermath of the tsumani, our cantor and congregants participated in a special Interfaith service to offer healing and financial support to tsunami victims. In a wonderfully upbeat event, our Bet Aviv choir made its debut performance at the Interfaith Musical Benefit held to support the Vivian Reed Fund. We listened with delight as the children of Bet Yeladim, a Jewish pre-school located at the Meeting House, sang songs that were directed by the Pastor of the Columbia United Christian Church. We learned to appreciate the music of our fellow congregations. Our Bet Aviv choir sang the Hebrew version of Halleluyah and led the participants in the English version towards the end of the concert. As a finale, we all sang We Shall Overcome as one congregation. Today Bet Aviv is an active participant in all phases of Intefaith life.